Guarding the net requires quick reflexes and the ability to anticipate the movements of the puck and players. Unfortunately, subtle problems with your vision may make it much harder to prevent goals. Vision therapy may be just what you need to improve your goaltending skills. Vision therapy consists of a series of exercises and activities that help your eyes work together and strengthens the connection between your eyes and the visual processing centers in your brain. It's an excellent solution for athletes who train hard yet don't feel that they're quite as effective as they could be. In fact, many college and pro sports teams make vision therapy part of their training programs. The therapy offers proven results. In one research study, college baseball players at the University of California, Riverside decreased strikeouts and improved their batting averages after the therapy. How Can Vision Therapy Help Me? Ability to Change Focus. Visual acuity, the ability to see near and far objects clearly, is necessary for good vision, but it's not the only ability you need if you play sports. 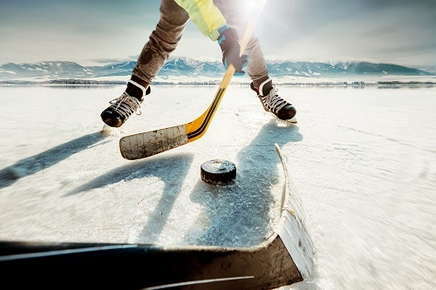 During a hockey game, your eyes must constantly switch between near and far objects, which requires them to work as a team. If there's a little lag time in the adjustment, you may temporarily lose track of the puck. Tracking. Keeping up with a fast-moving puck can be difficult if your eyes don't work well together or your eye muscles are weak. Unfortunately, if you lose sight of the puck for a second, the other team may score. As tracking problems may only present a problem when the puck crosses a particular area of your visual field, you may not even be aware of the issue. Depth Perception. Without good depth perception, it can be difficult to judge distances or anticipate the movement of the puck. Peripheral Vision. Much of the action takes place on the edge of your vision when you're a goalie. Concentrating on the puck while still being aware of distant objects can be a challenge. Focus on Moving Objects. Objects in motion are much harder to follow. Good vision helps you ensure that you can easily follow the puck, no matter how fast it moves. Visual Memory. What happened to that player who just passed in back of the net? Improving your visual memory will help you keep track of players and prevent an unanticipated attack on the goal. Hand-Eye Coordination. Hand-eye coordination is an important ability no matter what your position, but is particularly crucial for goalies. Ability to See Color and Contrast. It's not always easy to spot a tiny puck in a sea of white ice. Vision therapy helps you easily spot color differences and improves your ability to see contrasting dark and light areas. Before your first therapy session, you'll visit a vision therapist, an optometrist who has received extensive training in problems that can affect your ability to use your vision to its fullest. Your therapist will determine a diagnosis and create a treatment plan for you based on the results of your comprehensive vision examination. During treatment, you may play a computer game designed to improve eye tracking or improve your convergence skills by focusing on moving balls attached to strings. Your vision therapist may also use prisms or special filters during therapy sessions. Activities will be tailored to your sports goals and vision deficiencies. Whether you're a goalie or play another position or sport, vision therapy can help you improve your performance. Call us to schedule an appointment for your comprehensive vision examination.